Printable wall art has arrived at little dear! Printable art is an easy and inexpensive way to brighten up your room with unique artwork. 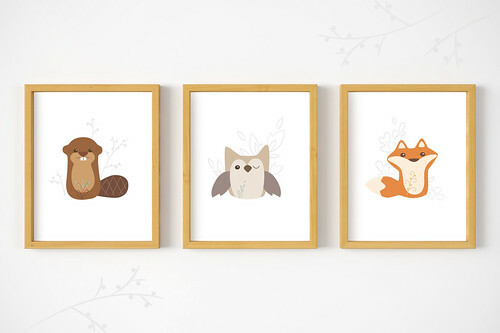 These adorable woodland animals are the perfect addition to your sweet woodland decor. You can purchase your favorite design and receive an instant download PDF file to print and hang. Or get a special price when you purchase all three! These little forest friends look super cute hung all together. You'll have a quick room upgrade or last minute gift in no time! I am glad so much of your stuff is downloadable. I live in the UK and used to buy stuff from the Us quite regularly. Postal charges are now so crazy (everywhere on etsy) that costs are now actively prohibitive even for tiny and light items. Such a shame. I know this is just a reflection of actual costs but it seems like charges have rocketed in recent years. It is lucky and I am thankful that you have beautiful patterns and books that I can access as I love your artwork.